The City of Aurora and Zagster, Inc. launched a new bike-share program that will provide Aurora visitors with a convenient, affordable and healthy way to get around town. 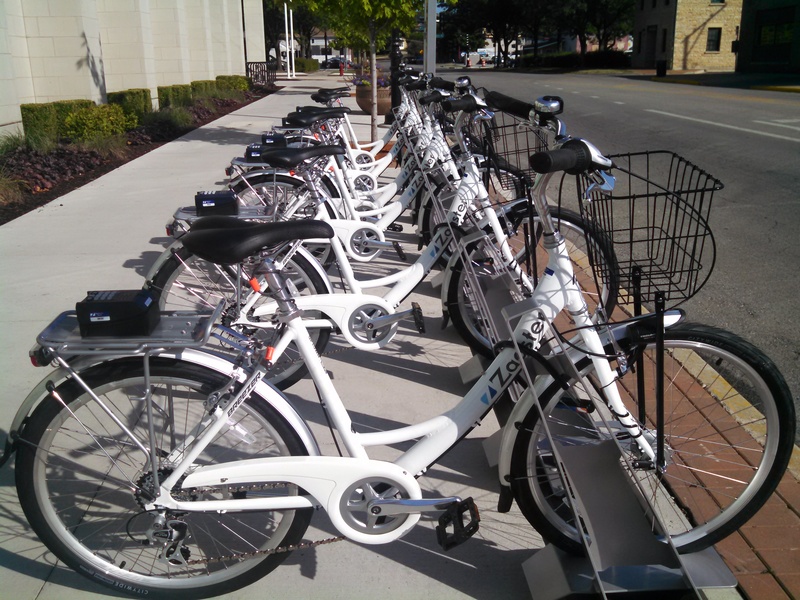 18 cruiser bikes are available at three downtown stations for riders to use for on-demand, local trips. Stations are located at RiverEdge Park - 360 Broadway Ave., Aurora City Hall - 44 E. Downer Place and Santori Public Library of Aurora - 101 S. River Street. This initiative creates new opportunities for visitors to experience the Aurora Area from a different vantage point and see it in a whole new light. Riders join the program by signing up for daily, monthly or seasonal passes. Rides for members - who must be 18 or older - are free for the first hour, and then just one dollar per hour after that. Bikes can be found via the free Zagster Mobile App - available for iPhone and Android - or online at zagster.com/Aurora-IL. Each bike has a unique number which riders enter into the app to obtain a single-use code to open the lockbox on the back of the bike (Alternatively, riders can obtain unlock codes via text message.) A key, stored inside and tethered to the lockbox, allows the bike to be locked and unlocked throughout a ride. After the rider returns the bike to a designated Zagster bike station, the rental ends and the bike is available for the next person to enjoy. Aurora's bike-share features the Zagster 8, an award-winning bike known for its practical design, comfortable ride and easy handling. The bike includes a spacious basket that's perfect for carrying groceries, takeout or personal belongings. And because rider safety is a priority, every bike includes automatic lights, a bell and full reflectors. Operating in more than 130 communities across North America, Zagster manages all aspects of its programs - from bikes and technology, to maintenance and marketing.